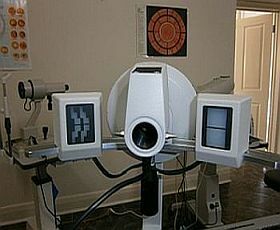 In this field it refers to measurement of the contour of the front of the eye, the cornea. As the light enters the eye it is bent ,or refracted by the front layer,so it can focus on the back of the eye,the macula. Disruption to the shape of the front of the eye will determine how you can potentially see. Generally it is done, when during the course of the exam, we suspect an optical defect of the front of the eye exists. These surface defects can be normal part of your development, or an indication of corneal anomaly ,dystrophy or disease. Corneal topographic instruments are utilised to measure progression of herniation of the cornea in conditions such as Keratoconus, post corneal graft patients, or most commonly when being fitted for contact lenses.